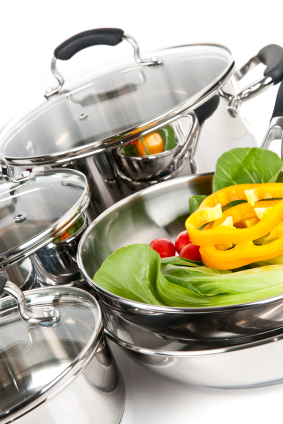 Glass pans are considered to be one of the healthiest options. Although there are white glass casserole dishes sold in the national chain stores, glass saucepans have been discontinued. However, you can still find them at thrift stores and on eBay. Porcelain covered aluminum is considered safe as long as there are no chips or cracks. These pans are lightweight and very reasonably priced. For example, Martha Stewart has a line of lightweight gray-colored porcelain pots that are sold at K-Mart. Teflon scratches easily and it toxic at very high temperatures. If you’re careful with your pans, Teflon is an acceptable option that’s safe to use for short, stove-top cooking. Raymond Peat explains that there are two main types of stainless steel, magnetic and nonmagnetic. The nonmagnetic form has a very high nickel content. He explains that nickel is much more toxic than iron or aluminum. It’s both allergenic and carcinogenic. To test for safe stainless, use a refrigerator magnet to determine which pans contain a high amount of nickel. The magnet will stick to the safer type of pan. Note: Newer thermos containers tend to be lined with stainless steel that does not pass the refrigerator magnet safety test described above. The older thermos bottles lined with glass are the safest option, and they are available at www.thermos.com.